Vintage Build™ contains an effective mixture of 3 essential muscle building ingredients: BCAAs, Creatine Monohydrate, and L-Glutamine. Vintage Build™ delivers an uncompromisingly dosed, safe and highly effective mixture of 3 essential muscle building ingredients: Branched Chain Amino Acids (BCAAs), Creatine Monohydrate, and L-Glutamine. This no-nonsense combination has been proven to work over time and is what gives Vintage Build™ its designation as a Triple Crown muscle builder. 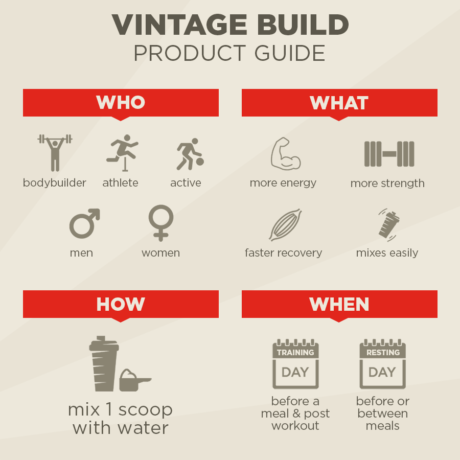 Vintage Build™ improves strength and speeds up recovery. When combined, these benefits allow you to perform your workouts at a higher intensity, which helps fuel further muscular development and growth. Vintage Build™, now available in Lemon-Lime and Fresh Berries flavors, has been painstakingly formulated to bring you its trio of essential muscle-building ingredients in a powder that mixes easily and tastes great with water or your protein shake, and contains no artificial flavors or sweeteners. Vintage Build is part of our Muscle & Strength supplements range. 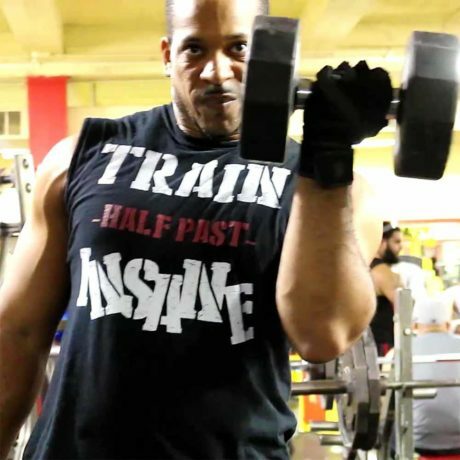 We created it because achieving a balanced, head-turning musculature should never come at the expense of your health. Good nutrition and a proper training regimen are key to building muscle. Muscle-builders can help you maximize your results with higher amounts of essential amino acids (your body’s building blocks) and nutrients that are not always practical to get from food alone. However, most come loaded with carbs, simple sugars or exotic ingredients that increase your caloric intake and water retention. They will increase your bodyweight, but those ‘gains’ will be mainly water and bulk. Moreover, their effects fade once you stop taking them. When it comes to building balanced and aesthetic muscularity, the Golden Era bodybuilders did it right. They did not fool around with fad ingredients, relying instead on what was tried, tested, and true. 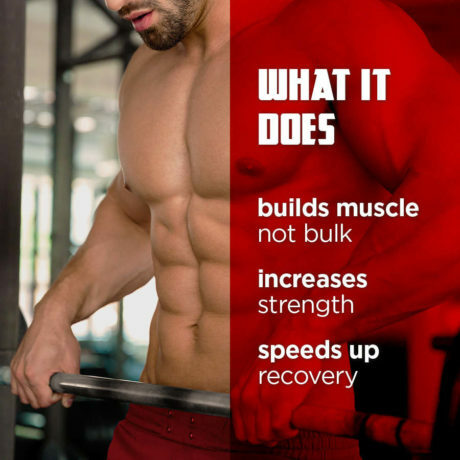 Vintage Build carries on this philosophy in what has become a fundamental trio of ingredients for natural bodybuilders and athletes wishing to build hard, quality, lasting muscle – not useless bulk. So stop wasting time and money adding bulk - and get Vintage Build to start building mass with class today! At Old School Labs™, we set out from the start to be a premium and uncompromising brand, delivering exclusively premium products. We sell our products directly to you and are therefore able to afford including only the best quality ingredients in all our products. Press More to read about the ingredients you will find in Vintage Build™ in descending order of weight. Isoleucine, Leucine and Valine are the most important of the essential amino acids and are absorbed directly into the muscle tissues. They are metabolized quickly to stimulate and support muscle protein synthesis and drive quality muscular development. This is the gold standard of creatine and increases strength as well as explosive endurance by acting as an energy reserve to fuel muscular performance and development. An amino acid that is conditionally essential when training at high intensity, it plays a central role in maintaining a positive nitrogen balance and an anabolic state by reducing muscle breakdown and supporting cells. Additionally, it acts as a muscle protector when on a fat-loss regimen. The “other ingredients” section on supplement labels has unfortunately become a convenient place for some companies to hide their sub-par ingredients, fillers and additives in plain sight. This is where you will commonly find the usual cost-cutting and unnatural ingredients that do nothing to help your health - ingredients such as sucralose, aspartame, gelatin, artificial flavors and colors, and a plethora of cryptic chemical substances that really don't have their place in your body if you want what is best for it. Stevia leaf extract is a natural sweetener that contains no calories. 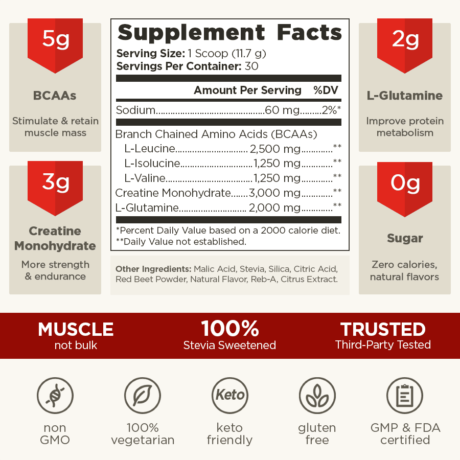 A minimal amount of high quality stevia is used to remove the bitterness and acidity naturally occurring in BCAAs & L-Glutamine. Only natural flavors go into our refreshingly crisp tastes. Countless iterations of taste-testing allowed us to arrive to a flavor, which in addition to being natural, tastes great by itself (with water) or mixed into flavored protein. Also known as apple acid (from Latin mālum / apple), it is found in apples and gives them their sour taste. In Vintage Build™, it is used to bring out the natural berry flavors. This vegetarian-friendly compound, naturally found in many foods, is used as a flow agent that guarantees the making of Vintage Build™ functions flawlessly and delivers each bottle to the highest exacting specifications. This natural colorant is free of chemical solvents and GMO ingredients, and is made from high quality fruits to give Vintage Build™ its light cherry color. As a dietary supplement, men and women take 1 scoop twice a day before or between meals. For maximum results, accustomed users take 2 scoops twice a day before or between meals. On workout days, include consumption immediately after your workout. Can be mixed with 6-8 oz. of water or combined with your favorite protein supplement. Is Vintage Build™ suitable for women? Absolutely. Vintage Build™ is suitable and safe for use by both men and women. Though male natural bodybuilders love using Vintage Build™, many women interested in building an attractive musculature without adding bulk have also benefited from using it. 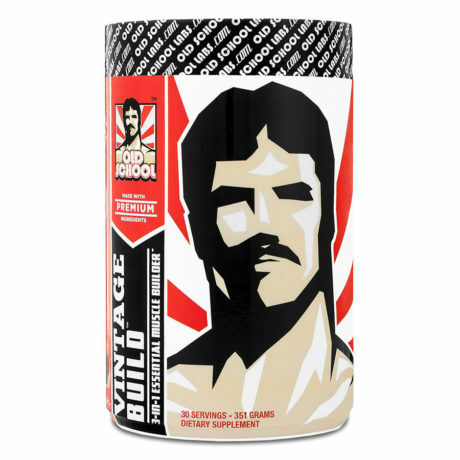 Does Vintage Build™ contain any banned muscle-building substances or other illegal ingredients? No. 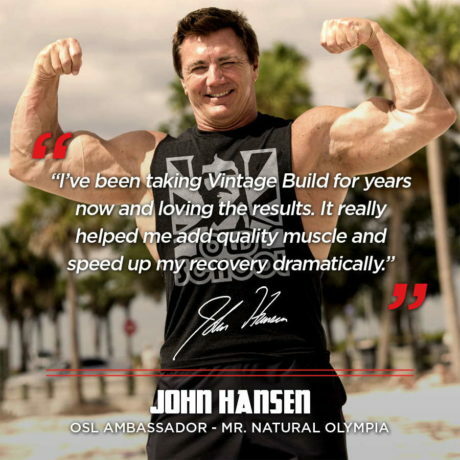 Vintage Build™ was specifically formulated with only tried-and-tested ingredients that are both safe and effective. No banned substances are ever used in any Old School Labs™ products. When during the day should I take Vintage Build™? Vintage Build™ can be taken at any time during the day. As a rule of thumb, split your servings between a.m. and p.m. to allow your body to be constantly fueled by Vintage Build™. If you are taking Vintage Build™ once a day, make sure to include at least one serving following your workout to accelerate your recovery and muscular development. Will I feel Vintage Build™ working? You will definitely feel, and see, Vintage Build™ working as early as 3 to 5 days after starting to use it. The trio of ingredients in Vintage Build™ will have a positive effect on your muscular development (that you will see), as well as your strength and recovery times (that you will feel). Does Vintage Build™ mix easily? Yes. Vintage Build™ mixes effortlessly and does not lump up or sit atop water. Whether in a glass or a shaker, Vintage Build™ will dissolve easily with just a few twirls of the spoon or shakes. Should I take a break after finishing a bottle of Vintage Build™? You don’t need to take a break after finishing a bottle. In fact, you can take Vintage Build™ anytime to support your muscle building goals. Does Vintage Build™ contain any carbs? Vintage Build has 0 carbs and 0 sugars. Some other notable 0s: 0 artificial flavors, 0 artificial sweeteners, and 0 compromises. If you haven’t tried it yet, we hope you’ll do that soon – you won’t regret it!